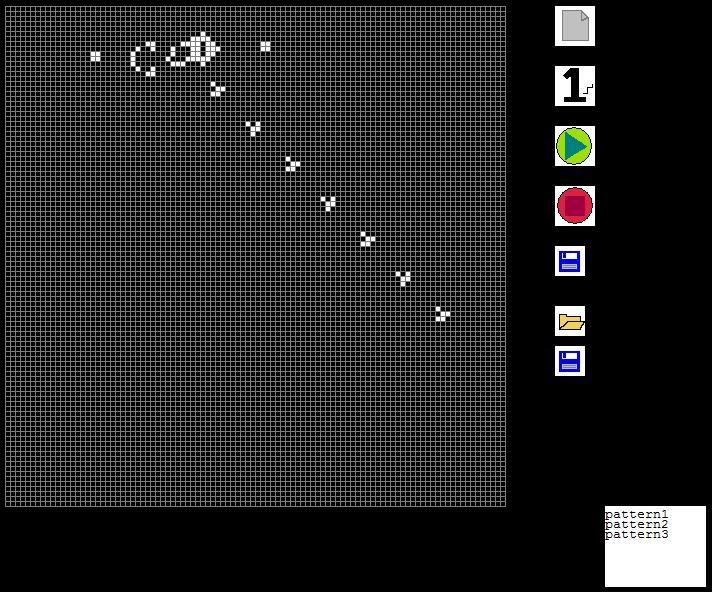 John Conway’s Game of Life simulates how small structures with simple rules of interaction can lead to complex behaviour. The user places cells in a grid, and these cells obey the following rules (copied from an on-line version of the game). each cell with two or three neighbours survives. each cell with three neighbours becomes populated. Click repeatedly in the grid to create a pattern of cells. The buttons described here from the top down allow you to (1) start afresh, (2) run the algorithm a step at a time, (3) run rapidly through each stage, (4) pause, (5) save the complete grid to a file, (6) open an existing file of a complete grid and (7) save a selected rectangular area of the grid (a "pattern"). When you press the last button you see new buttons to save a pattern or cancel. Use the mouse in the grid to drag a green rectangle to mark the area to save. 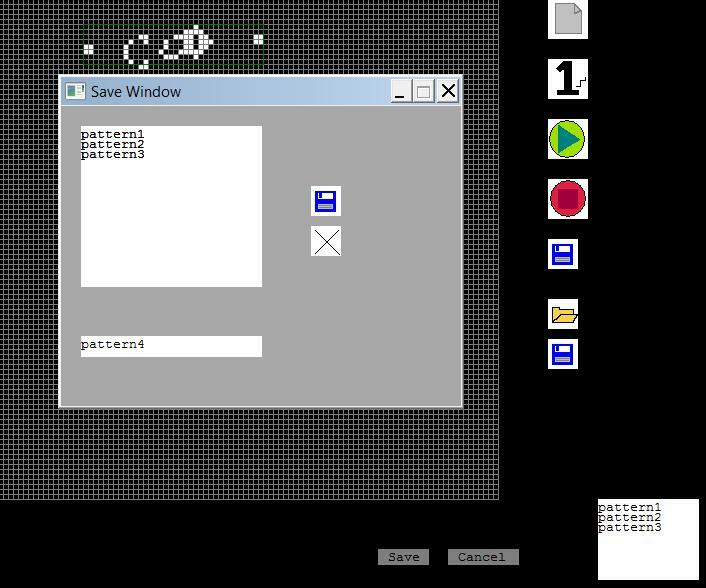 We show a pattern being saved in the following screenshot. You can select a pattern by clicking on its name in the white box at the bottom right of the screen then display it by clicking on the grid with the right mouse button. Download here a zip file containing the source code (gameoflife.txt, saveall.txt, loadall.txt and savepatt.txt) a folder savedata of text files and a folder named Icons. You should unzip the files so that Icons and savedata are in the program folder. You need to compile the source files to produce the executables saveall.exe, loadall.exe and savepatt.exe that program GameOfLife uses. (You may already have saveall.exe and loadall.exe if you have used program Crazy Paint). In order to run program GameOfLife, you will need to have downloaded Stefan Berinde`s wingraph.zip file as described in our Graphics tutorial. You should copy the unzipped wincrt.pas, winmouse,pas and wingraph.pas (from the src folder) into your program folder. (The compiled units are included in the zip file but you might as well have the source code available for reference). You should find these files useful for your own graphics programs. Follow the link at the bottom of this page to see the source code of savepatt, which is very similar to that of saveall (included in our section on program CrazyPaint). //User selects the pattern from those displayed in the white box. //This pattern is added to the screen using a right click. Could you write your own game of life program?